Each of us has an ability I like to call the microbial Midas touch. Everything we get our hands on, whether it's Krubera or Antarctica or the Moon, inevitably becomes contaminated with introduced microbes. The contamination of Antarctica with non-native microbes is an ongoing process, initiated the very moment the first explorer set foot on the continent. In addition to the bacteria and fungi we've unintentionally sown about since then via our personal microbial clouds and digestional leftovers (i.e. poop), microbes have hitched a ride in soil (attached to vehicles, footwear, and vegetables), building materials (e.g. timber), food, plants (greenhouse escapees), and domestic animals (with microbe-rich clouds and poop of their own). I've put together a roughly chronological and very much incomplete account of people bringing specific microorganisms (or microbe-bearing plants and animals) to Antarctica. During the early (heroic) period of Antarctic exploration, base camps were set up on the shore of Ross Island in McMurdo Sound. Huts were constructed at Cape Royds and Cape Evans as part of the 1907-1909 Shackleton expedition and the tragic 1910-1912 Scott expedition, respectively. Decades later, bacteria were successfully cultivated from materials still present at the camps such as human poop, pony poop, dried peas, pearl barley, and straw (for the ponies). The persistent bacteria included a Pseudomonas species, a Bacillus species, and some sort of filamentous Actinobacteria. The latter two were able to produce spores, which can persist in a viable state for long periods of time under harsh environmental conditions. 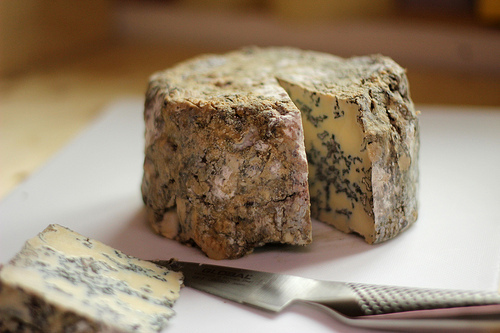 Fungi were also cultivated from the huts, their presence being attributed to human activity. 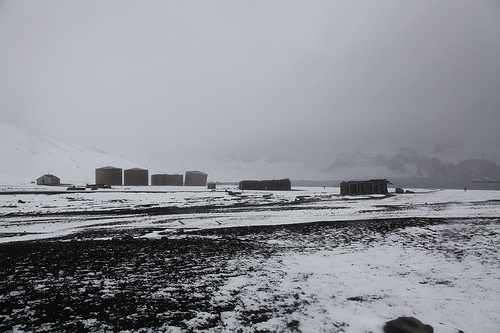 In the early 20th century, a whaling station was constructed on Deception Island. It was used as a base of operations for processing harvested whales into oil during the 1910s and 1920s. Pigs were kept at the station, so porcine microbes likely ended up in the surrounding environment. A study of the station in the 1960s found evidence of wood-eating fungi Peziza domiciliana (known to show up indoors) and Pholiota spumosa growing on the decaying timber used to construct the station. As there aren't any trees on Antarctica, it's possible these fungi were brought to the continent via the timber or other materials imported to the station. Between the late 1940s and mid 1960s, Chilean stations operating in the South Shetland Islands and northern Antarctic Peninsula were home to sheep and poultry. These animals likely contaminated the local environment with their indigenous microbes. 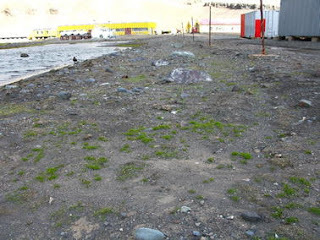 A colony of Kentucky bluegrass (Poa pratensis), which is decidedly not native to Antarctica, was accidentally established at Cierva Point on the northern Antarctic Peninsula during the 1954-1955 season. As of 2012, the grass was still there (growing slowly outward via runners), but apparently hasn't been able to spread elsewhere since it doesn't produce seeds. P. pratensis is typically inhabited by fungi of the genus Epichloë (they grow in the spaces between plant cells), although it's not known if they're present in the Antarctic colony. These fungi help the grass to grow, tolerate drought, and fend off herbivores. In return, they gain shelter and food. Soils near Mawson Station (established in 1954) and Casey Station (established in 1964), two of Australia's permanent Antarctic bases, were found to contain a bunch of fungi not otherwise reported elsewhere on the continent, pointing to human introduction. Supporting this, these fungi (many of them species of Penicillium) are common inhabitants of temperate climates and are associated with foods, damp buildings, or trees. The bacterium Staphylococcus epidermidis, which resides on human skin, has been detected in soil in near McMurdo Station (USA) and Scott Base (New Zealand), both of which were established on Ross Island in the mid 1950s. Looking briefly beyond sites constructed for human habitation, members of a 1971 expedition to remote Mount Howe in the La Gorce Mountains managed to contaminate the mountain with a Penicillium species. This occurred when one of the cans of food they brought along was opened and found to have grown a nice carpet of fungus. The wind then proceeded to blow fungus spores all over the surrounding area. A study published in 2004 reported the revival of known bacterial residents of the human gastrointestinal system from frozen poop deposited in a waste dump at Fossil Bluff Field Station, Alexander Island some 30-40 years earlier. While the standard approach to dealing with human waste in coastal regions is to dump (heh) it in the sea, further inland it's typically buried in the snow and ice. In this case, folks pooped in empty flour tins and tossed them in a dump. This exhilarating practice was discontinued following the installation of a chemical toilet in the 1970s (which was emptied into a deep crack in the ice). The more you know! Another non-native and potentially fungus-hosting grass by the name of Poa annua appeared near the Polish Antarctic Station Arctowski on King George Island in the summer of 1985-1986. It's suspected the grass originated from the greenhouse it happened to appear outside of. Since its escape, P. annua has also been found growing above buried hot water pipes and has spread via seed to nearby piles of debris (moraines) left behind by a shrinking Ecology Glacier. It's considered an invasive species, being capable of slowing the growth of neighbouring hairgrass and pearlwort, the two flowering plants native to Antarctica. Weirdly, the grass forms dense clumps in Antarctica, yet grows as loose tufts in temperate regions. Minasaki R, Farrell RL, Duncan S, Held BW, Blanchette RA. 2001. Mycological biodiversity associated with historic huts and artefacts of the heroic period in the Ross Sea region. Antarctic Biology in a Global Context, VIII SCAR International Biology Symposium, Amsterdam. Abstract S5P28. Smith RL. 1996. Introduced plants in Antarctica: Potential impacts and conservation issues. Biological Conservation 76(2):135-146.